One of the delights of living in Atlanta is that the climate is relatively warm throughout the year, which means, you will hardly run out of outdoor activities. These outside pursuits include exploring nature preserves, taking part in water sports, watching favorite sporting events, shopping, watching movies among many other recreational ventures. Clearly, the city of Atlanta has more than enough treats to satisfy any outdoor adventure thrill seeker. As an Atlanta business owner I often get asked by new residents what I recommend for the top outdoor activities in the area. The following are some of those remarkable buzzes. The Beltline is one of the newest open-air sites in Atlanta. It is comprised of walkways, open fields, and a twenty-two mile stretch of pristine railroad tracks surrounding the core of the city’s in-town neighborhoods. Both locals and visitors frequent the Beltline each week to exercise, explore, and spend time with friends and family. Some of the everyday activities in the Beltline include biking, strolling, jogging, and skating. In fact, the first ever public skate park, the Fourth Ward Skate Park is in the Beltline. If you are an art lover, the Beltline is also home to ART on the Beltline, one of the largest temporary art projects in the southeast. While spring means the blooming of flowers, for sport loving Atlanta residents, it is baseball time. And who can blame them? Atlanta is home to the Braves, one of the prominent MLB teams in the country. If you are into sports, you need to catch one of the Brave games at their newly constructed SunTrust Park. Besides enjoying the game, you can tailgate at the Battery Atlanta and set up your mini-grill. If you want, you can also take part of the Turner Field tour, which takes place all year round and starts from the Braves Museum & Hall of Fame. It then extends to the broadcast booth, press booth, clubhouse, dugout and the luxury suites. If you visit the venue on Sunday, you might just be fortunate enough to get autographs from famous Braves alumni. If you are in search of a free, exciting, and family-friendly outdoor attraction in Atlanta, you need to check out the Martin Luther King Jr. historical site. The site sits on an estimated thirty-five acres piece of land and consists of landmarks, modern-day facilities, and monuments. By going through the site, you will learn about Dr. Martin Luther King Jr’s birthplace, life, struggles, and legacy. 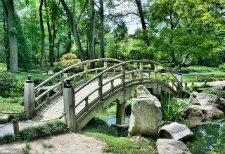 Adjacent to the Piedmont Park in Midtown Atlanta lies the blissful thirty-acres Atlanta Botanic Garden. Unlike most botanical gardens, this turf offers more than just a tranquil yard of blossoms. It provides a myriad of excitements that include garden light night shows, weekly classes on how to grow edibles, and Yoga training in the field. Furthermore, the garden has distinct sections that offer unique, thrilling experiences. For instance, the Fuqua Orchids Center showcases rare collections of orchid varieties, while the Kendeda Canopy Treetop Walk presents the perfect opportunity to learn more about the Sheffield Botanical Library’s new plants. If you are touring with kids make sure to visit the Children’s Garden, the Sunflower Fountain, and the Venus flytraps. An exciting moment for me is when the Falcon’s starting lineup emerges from the dugouts and run onto the field, all psyched up for the game. The atmosphere at such a time is just eccentric. Even if you are not an NFL enthusiast, it will be worth your while to show up at the Falcon’s Mercedes-Benz Stadium. The arena is right in the center of the city’s entertainment district, which means that whenever there is a game, there will always be plenty of other complementary fun activities. If you are in search of an outdoor activity suitable for all family members then the Centennial Olympic Park is for you. The place has a wide array of activities, which have transformed it into a thriving tourist district. For starters, it is the heart of the downtown live music, and it hosts a series of concerts such as the Music at Noon and the Wednesday WindDown. Beyond the weekly music presentations, traditional yearly events like the 4th of July celebrations, the Shaky Knees, and Sweetwater 420 Festivals, also take place at the park. If you care less about music, the Splash at the Fountain of Rings and delicacies from the Googie Burger will keep you hooked to the Centennial Olympic Park. The ATL-Cruzer electric car and Segway tours are one of the highly rated outdoor attractions in Atlanta. The electric car tour takes approximately ninety minutes, while the Segway ride takes about two and a half hours. Both trips involve exploring the historic neighborhoods like the Centennial Olympic Park, CNN Centre, Georgia Aquarium, Coca Cola World, the Fabulous Fox Theatre and much more. Both the Electric car and Segway tours are available on a daily basis at an average cost of $29 and $59 respectively. The car travels, however, are available at 11 am, 1 pm and 3 pm, while the Segway rides are open at 10 am and 2 pm. If you are a film lover the Movie tour will tickle your fancy. You simply need to reserve a seat on one of the comfortable Movie Tour buses that have screens. These screens showcase the great television and film locations as the bus navigates throughout the city streets. On those buses, there are Insider guides who bring out fascinating and original behind-the-scenes stories about the movies and TV programs. On the western side of Atlanta lies the Atlantic Station which hosts over fifty shopping, dining, entertainment, and recreation establishments. It is a fantastic area for shopping since it hosts renowned retail outlets like H&M, GAP, Dillard’s, IKEA, LOFT, Victoria Secrets among others. If all of the shopping makes you hungry and tired, the Atlantic Station’s walk-able area has many bars and restaurants suitable for fine dining and classic pub nourishments. Furthermore, these establishments including the Central Park, host a variety of musical concerts and exciting activities. For instance, if you visit the area in winter you will enjoy skating at the Skate Atlantic Station, an outdoor ice skating rink. While during Easter, the station hosts the traditional Easter Egg Hunt and enjoys occasional visits from the Easter Bunny. Another interesting outdoor activity in Atlanta is visiting the historic Oakland Cemetery. You can view the cemetery by yourself, or you can hire a knowledgeable tour guide to walk you through. The garden cemetery houses the graves of the men and women who laid the foundation that led to the existence of the modern day Atlanta. These include early settlers and builders as well as notable citizens such as Mary Mitchell, Bobby Jones, and Maynard Jackson. Besides the graves, the cemetery garden is a showplace of architecture and sculpture prowess, as well as a botanical preserve. Furthermore, it offers an excellent view of the city’s growing skyline. As you can see, Atlanta has more than its fair share of outdoor attractions, sufficient to satisfy the needs of any outdoor thrill seeker. You only need to make time and visit the places that you desire.